Over at the annual CTIA international wireless tradeshow, Sprint has officially unveiled the latest entry in its successful EVO line from HTC: the EVO 3D. As the title indicates, the marquis feature of this new EVO is the ability to display content in 3D. But this isn&apos;t just any old 3D device, the EVO 3D provides a 3D experience that doesn&apos;t require glasses, a la the Nintendo 3DS, and, perhaps most impressively, allows you to record your very own 3D videos via dual 5 megapixel cameras with flash around back. 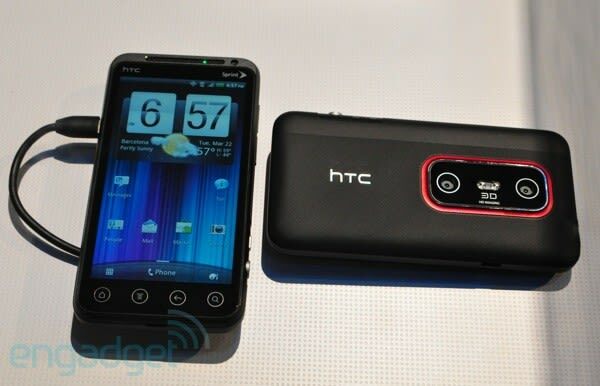 Picking up where the original EVO left off, the 3D is totally spec&apos;d out internally as well, with a 1.2 ghz dual core processor, a 4.3 inch display, Android Gingerbread with HTC Sense, 1080p HD video playback, a 1.3 megapixel camera up front for video calling and a WiMax radio for 4G speeds and mobile hotspot. No word on what this behemoth will cost, but Sprint is expected to start shipping it this summer. Get ready to make your 3D directorial debut.